Cinedigm released Winx Club: The Complete Original First Season on DVD on March 11th, 2014. Now because we have always been fans of fairies (yes even in a household of boys), this is nothing like the 'other' popular fairies which we normally watch. The Synopsis says "The Winx Club is a modern fantasy adventure series following six fashion-forward best friends (Bloom, Stella, Flora, Musa, Tecna and Aisha). The show is situated mainly in the Magical Dimension and on Earth. 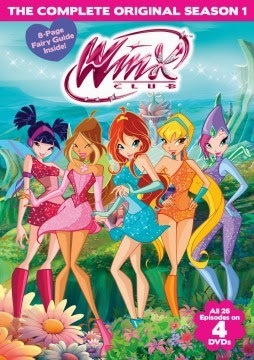 When trouble arises, the Winx Club transforms into beautiful fairies who use their unique magical powers to fight villains and save the world from evil. Throughout the story, they discover new, evolved, much stronger fairy transformations and forms, unlock new secrets and even stronger magical abilities, battle against the darkness and support Bloom as she tries to discover her true past, home world and birth parents"
Ever since Dane started preschool last year, he has seemed to find himself several best girl friends. Apparently, he is always leading a clique of girls as the "Dad" while they play house together (or at least it was that way last year). On one of his play dates at a good friends house he discovered the Winx Club Fairies. When the movie arrived both boys enjoyed watching the episodes however, didn't seem as interested as they have been in the past! Recommendation: Although this is geared more toward girls, I like that the graphics are bright and exciting as well as the boys seem to enjoy watching it with their girlfriends when they are over. My only real complaint is that these girls are just too flashy for this age group making it seem like girls need to dress this way from the very start.